If you've had the pleasure of spending an evening at Newcastle’s Grain Store during one of their beer degustations, you’ll know they deliver the kind of spread that has the table heaving with as much goodness as you could wish for in a single sitting. A brewery that has long been a favourite guest at said table is Bridge Road Brewers and for the annual feast just gone they went the extra mile – or 450 miles, as the case may be – by collaborating on a beer to be served at the event. Being the latest in Bridge Road’s long running Bar Series, whereby the brewery teams up with some of the best beer venues in the country to come up with a one-off beer, the Grain Store team took a trip down to Beechworth and nutted out an idea with the brewers that would incorporate a beer style the bar folk enjoyed drinking at this time of year (namely, red ales) and a couple of their favourite Bridge Road beers (namely, the Fat Man, Red Suit and Beechworth Pale Ale). 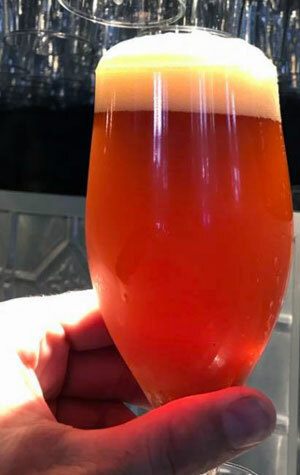 The resulting new beer is something of a misnomer in the Newy Beech Red XPA, or red extra pale ale. The driving force behind it is the hops, with Citra, Galaxy and Vic Secret varieties all thrown at it until they reach what the collaborators describe as “dank resin, citrus notes on the nose” and a “juicy confectionery character”. But the intent was to balance that on a biscuity malt backbone and keep the ABV down to just 5.5 percent so you can enjoy a few.